Regarding sponsoring funds, NST Group has decided that as we are able to contribute, sponsoring funds shall go directly and without reducement to the local environment where we operate, and mainly to children whom themselves contributes to, or are doing positive ventures and activities, elders or other special needed – or positive common verntures in local environment. We have been sponsoring “The Worlds longest Heering Table” made and arranged by “Association of Chefs” at Haugalandet area every year since 1997. We had our 10th anniversary as sponsor in 2007, and was honored by the Association with a statue made by local ceramic artist Karen Vikse. 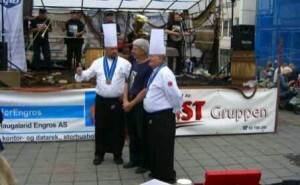 In 2009 the event had its 25th anniversary, and NST Group took part as usual. We have continued to support this event since, and in 2015 we had been their supporter for 18 years continously. 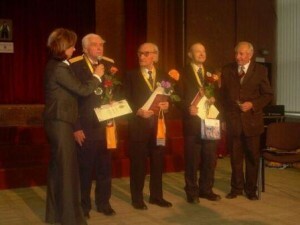 In October 2011 the district of Vilnius, Lazdynai, where NST Baltija are located arranged an event for jubilants thet could celebrate 100 years birthday that year. We respect such a considerable age and NST Baltija supported the arrangement. 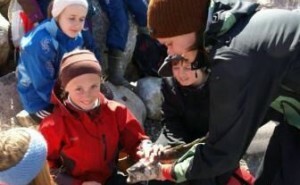 In 2010 NST Group sponsored a project by NJFF Rogaland (Norwegian Hunter, Fisherman and Wildlife Association) to bring school children out to nature to learn about it. This has resulted in many days at fishing camp for students at primary schools in Rogaland County. Our support went to 6th grade at Skjold school in Vindafjord, who got a fishing day where they learned about fish and fishing, and could eat and enjoy all the fish they caught. 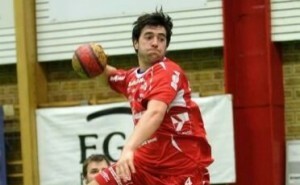 In 2010 NST Group also sponsored Haugaland Håndballklubb to avoid bancruptcy. We also gave long term support to Haugesund Ridesenter (Stable) in Haugesund. In 2009 NST Group sponsored class 10E at Vormedal secondary school at their stdy trip to Poland, where they among other places visited Auschwich concentration camp from World War II. To the left is a picture of classes 10A and 10E together with teachers and followers. We also this year continued our support to handball team of Nord Sportsclub girls born -94. 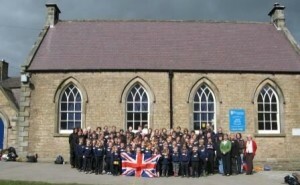 In 2008 we sponsored class 7B at Lillesund school in Haugesund on their trip to West Burton, North Yorkshire, UK. They already had done a considerable effort themselves to raise the funds for this trip, and we helped them a little on their way. They are following a study called “Comenius” where they cooperate with other European schools. 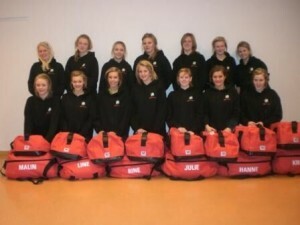 We also sponsored sports club “Nord” hanball team girls -94 on their trip to tournament in Kristiansand. In 2007 we sponsored sports club “Nord” hanball team girls born -94 with training suits. This year we also collected clothes to benefit a single mother with bad economy andmany children to provide in Lithuania.